The bomber jacket twas one of those trends that took me a while to come around to. I kept seeing them on other bloggers and though they were so cute. I just wasn't sure if I could make them work in my closet. Well, then I started seeing floral bomber jackets in stores! That little nudge I was feeling about trying out a bomber jacket quickly turned into a shove and I found myself ordering this floral beauty from SheIn. For under $30, it's the perfect lightweight spring jacket. I find myself pairing it with jeans frequently on weekends! This bomber is so cute and love your pink flats. I love the dark floral! This is such a cute spring look! In love with this bomber Laura! Such a cool look and those flats are perfect with it. This jacket is darling! I actually love this trend but haven't found a bomber that felt flattering on me. You're motivating me to not give up the hunt! This floral bomber jacket is so cute on you, and perfect with the jeans! :) I'm like you, I like the printed versions of the bomber jackets more, but I never found the perfect one. Oh wow and its cherry blossom print ! I have to say it also took me forever to get around the bomber jacket idea and when I finally did go out and buy it... well, its been worn briefly. Too briefly. Such a great floral bomber. Terrific accent piece, Love how you styled it simply. Beautiful look Laura! I totally felt the same way about bombers too, Laura! I felt like they were so unflattering because of the shape (or non shape, I should say). But now that they have all of these fun prints---I'm starting to come around! I don't have a bomber jacket yet, and it was also an item I wasn't sure would work for me. I keep seeing really cute ones though, and this one you have is one I would totally wear! I like how you kept the rest of the look really simple. 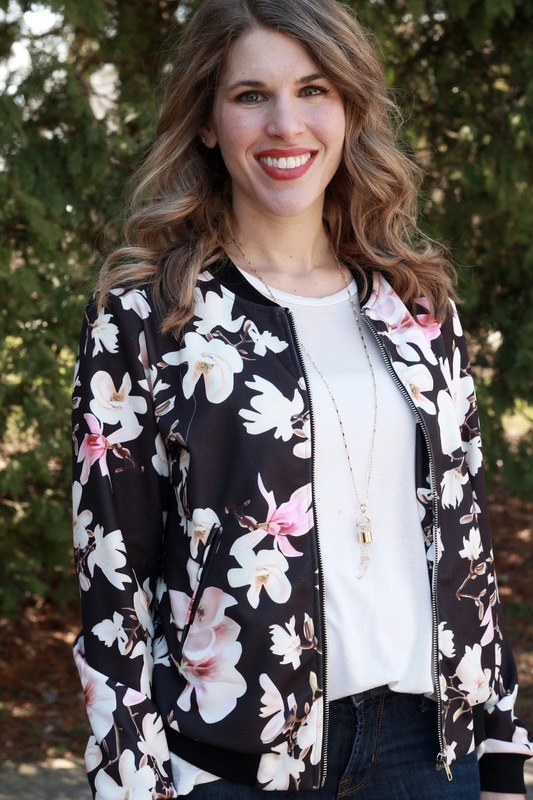 You look adorable in this cute floral bomber, Laura! Love the bomber! Happy weekend! This bomber jacket is fabulous for spring! I need one in my life! So pretty! Floral bombers are def. on trend right now! I love the coloring of this one, too! That bomber jacket definitely adds to this outfit, Laura. It's so easy to put on and elevate a simple top and jeans combo! 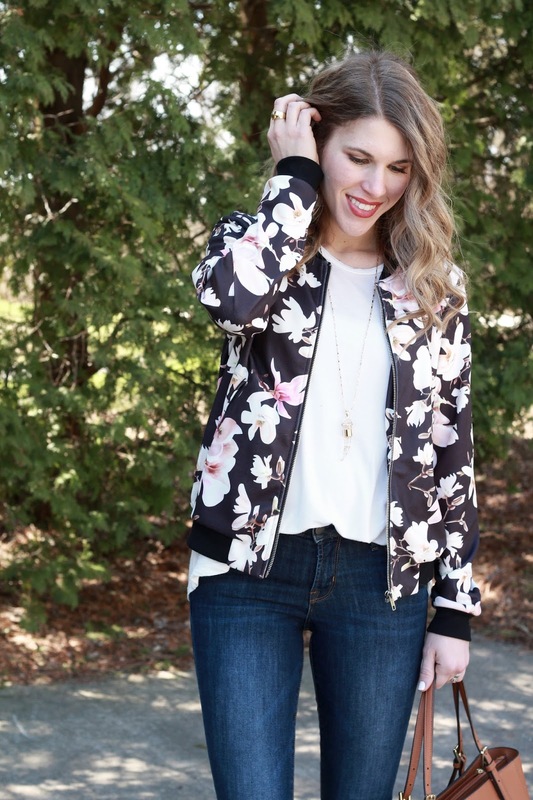 I'm absolutely LOVING this floral bomber jacket - you look amazing! This bomber looks great on you. I'm on the fence about them and haven't found the perfect one yet. I'm not sure I would get a lot of wear out of one in our climate. I love this gorgeous floral bomber! It really is a statement piece and will add a fun element to your wardrobe. I need to wear mine more before it is too hot here. thanks for linking up, Laura!